Quality for the 21st Century! The ZIGGURAT Product Line derived its name from the "ziggurats" ... those mighty constructions of six thousand years ago. The Tower of Babel and the Pyramids were among these highly significant creations. This type of pyramidal construction has since come to signify solidity and ingenuity. In the tire industry, ZIGGURAT has rapidly become a renowned name for tires, tubes and flaps. We more than live up to our name through our products' exceptional quality and reliability. Our tires are manufactured at a number of the best factories worldwide under special agreements and we are currently expanding our production. Our tire products meet the most stringent international quality standards and are certified by the United States of America's Department of Transportation (DOT). Ziggurat tires also hold ISO9001, ISO9002, and COVENIN (Venezuela) certification. 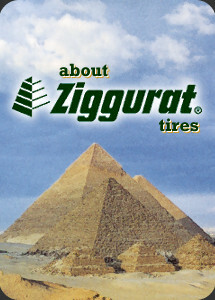 21 Century Tires, of the United States, is the owner of the ZIGGURAT brand and its exclusive distributor worldwide.